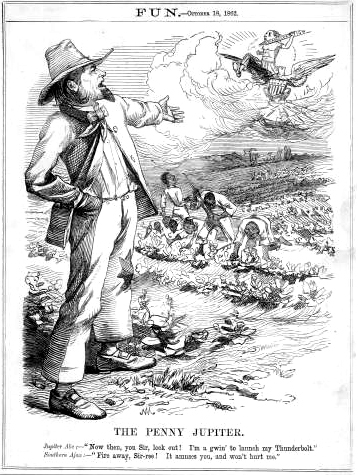 Description: Cartoon of “Jupiter Abe” in the fields with working slaves announcing he’s going to launch his Emancipation thunderbolt. The thunderbolt is atop an eagle carrying a shield designed with the American flag. The slaves working in the field are telling Lincoln to do whatever makes him happy, but to also make sure that they do not get hurt from emancipation.